If you want to follow this series it starts with the reign of the first Roman emperor Augustus. 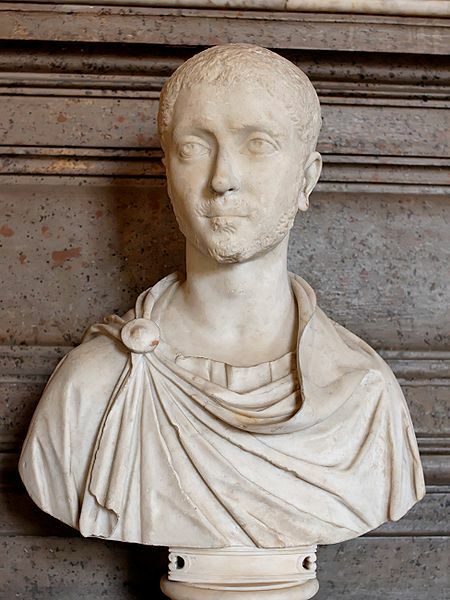 The previous episode is about the most eccentric emperor of Rome, Elagabalus. With the body of his cousin bobbing down the Tiber in disgrace, Alexander was instantly acclaimed the emperor and acquired the huge list of titles that the role had accumulated in the years since Augustus. He was only 14 so it must have been somewhat bewildering to find himself now father of the nation. Most of the time in writing up the scripts for this podcast I am cutting Gibbon’s text down and getting rid of unnecessary detail. The book is after all, long enough. But in the case of Alexander I think it is worth giving a bit more of a picture because his reign really does illustrate extremely well just what was going wrong in Rome at the time and why a system that had worked so well under the Antonines and which nominally had hardly changed, was to be gripped by crisis for decades after the death of Alexander. To read Gibbon you would think that Alexander’s instant acclamation to absolute power was in some way a result of sympathy for him and his personal qualities and charisma. Well history is rarely swayed by niceness. What was really going on? I turned to the Historia Augusta, one of Gibbon’s sources. It is easy to work out the sources Gibbon used. All of them. I imagine that if Gibbon had hired a PR agency they would have come up with a motto like ‘reading Latin literature so you don’t have to’. Reading the Historia Augusta it is pretty clear what the motivation behind the praise being lavished on Alexander was. The pressing need was to establish the regime as legitimate and in control. If this wasn’t done the army would certainly fill the vacuum. The balance of power between the Senate and the army was hugely in favour of the troops. The only card in the Senate’s hand was its residual authority hanging over from previous eras. It played this weak card like its life depended on it. In fact, the life of some of it members probably did depend on it. If you are a Roman history buff you are probably wondering why I am quoting the Historia Augusta with such reverence. I know, I know. It is a notoriously unreliable testament to say the least. Like many, I am of the view that the Romans themselves probably regarded the Historia Augusta as strictly for laughs. But I think the account of why the Senate did what it did rings true, and the risk of civil war would have been in the forefront of everyone’s mind. But although the attractive character of Alexander was probably not the key factor in his lauding by the Senate, his character was nonetheless quite an appealing one, especially when compared to his cousin. He seems to have been hard working, conscientious and with a passion for education. It’s not hard to see why Gibbon approved of him. He was a model for an enlightened prince. But it was his mother, Mamaea, that was to prove decisive. She took effective control of the situation and was the de facto ruler of Rome from that point onwards. This was justifiable when Alexander was very young. It became steadily more questionable the older he got. Civil administration was quickly brought under the control of a council of wise heads. The chief among these was a famous and popular lawyer called Ulpian. The council was honest and effective, and the excesses and chaos of previous reigns were tackled. The problem was the army. It was aware of its power and would simply not be brought to heal. The Roman Empire had in effect become a very large glorified protection racket run for the benefit of its nominal defenders. The administrative abilities of Ulpian for example did not protect him when he fell foul of the troops. He was killed in front of the emperor, despite the emperor pleading on his behalf. Alexander did make efforts to assert his authority. But it would have taken a man of huge strength of character to escape from the gilded cage in which he found himself. On one occasion he addressed rebellious troops and won them round by very nearly carrying out a threat to dismiss them. He later had the ringleaders killed. This must have taken huge courage, and suggested that he was not short of the kind of willpower that would have been needed. In addition to some direct confrontation, there was also some deft scheming to get men into positions that suited the emperor. But it was a hopeless situation – the strong men were aware of their strength. And to make things worse, there were also significant military threats from the Persians and the Germans. Fate had dealt Alexander a poor hand. The evidence is that he was an able and capable man who under other circumstances might well have proved to be a great emperor. He could easily have settled in to enjoy the life of the pampered first citizen. That he tried to break out of the situation he was in is a tribute to him. But it is hard to see what he could realistically have done differently given that he came to the throne with no connection to the army and no independent power base. The one thing he could have done, but didn’t, was to escape the hold his mother had on him. Perhaps if he had lived longer he would have done. The biggest threat came from the Persians who made a bid to regain Asia Minor which had been lost to them since the time of the more famous Alexander some 400 years before. The threat was serious and real and the Persians had some early successes, but in the end the superior Roman resources were brought to bear and the Persians were forced to sue for peace. There are varying accounts of how well the emperor performed in the field, but in any case the victory was not glorious enough to strengthen his hand internally or to win him the love and respect of his troops. There was, in any case to be no peace. The Germans were stirring on the borders, and Alexander was obliged to lead the legions against them, leading them in fact into Germany itself. He had serious difficulties with the troops. They nearly rebelled when he paid off one tribe rather than fighting them. We don’t know whether this was a good or bad decision. But presumably the rank and file were more bothered by the missed opportunity to acquire some booty than in the overall strategic situation. The discontent with his handling of military matters grew as the campaign progressed, and in the end he was killed by his own troops on the 18th of March in 235. Fittingly, his mother was killed too. The death of Alexander was not the result of popular discontent or palace intrigue. It was certainly not an ideological challenge. He simply lost control of the army. The soldiers got rid of him because they didn’t like the way he did things – or to be precise, the way his mother did things. And they chose a successor that was to their taste. There was no pretext of consulting the Senate, or fashioning an elaborate smokescreen of supposed legitimacy. If you could command a body of troops, you could make a play for the top job. For the rest of the third century, this would be the way that it would be. In the next episode we cover the career of Maximin, the first barbarian emperor of Rome. Thanks to Wikipedia for the use of the images. Previous PostWomen in Ancient Rome: Gibbon’s Decline and Fall of the Roman Empire Chapter 6 Part 4Next PostAnother update…. Yes please continue – Maximinus Thrax and the last burst of energy from the senate is﻿ very fascinating. @antoninus138 Yes it was an impressive display from the Senate in the next reign. I have already recorded that episode, but I have just changed server and due to bandwidth constraints it will be a while before I can post it. I am currently writing up Valerian, so I am a fair way ahead and have plenty of﻿ content in hand to keep up a steady stream. I sort of aim to finish volume 1 by Christmas.